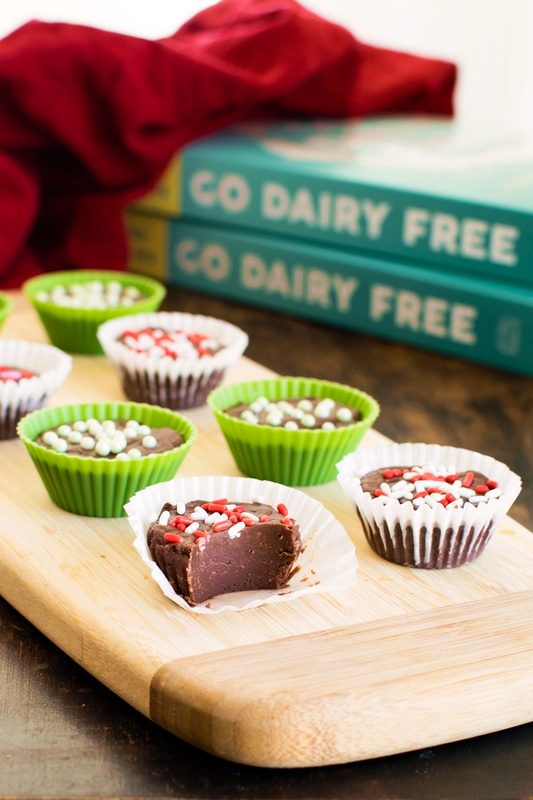 Years ago, I whipped up these dairy-free peppermint fudge bites to test out So Delicious’s new Culinary Coconut Milk. In my opinion, it was the best coconut milk on the market. Unfortunately, they had supply issues, and that product line was eventually discontinued. But the vegan fudge bites recipe lived on. In fact, I perfected it for inclusion in the 2nd Edition of Go Dairy Free: The Guide and Cookbook. And today, I’m sharing the updated version and some new photos with all you! 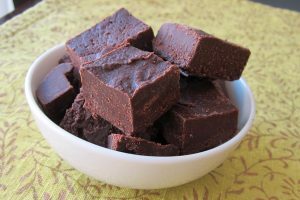 This dairy-free fudge bites recipe is so simple, that I’ve added it to our Kids Can Cook section. In fact, one of my nieces had fun making them! She made them into squares, like traditional fudge. I just like the clean, easy, and cute presentation of fudge in mini cupcake liners. If you’re concerned about the taste, don’t be. These chocolates are as rich as classic fudge with a smooth, soft bite. Everyone, and I do mean everyone, loves them. The flavor is purely chocolate with a nice infusion of peppermint. You can adjust the peppermint extract to taste, but I found that 1/4 teaspoon was a crowd-pleasing amount. And no, you can’t taste the coconut. 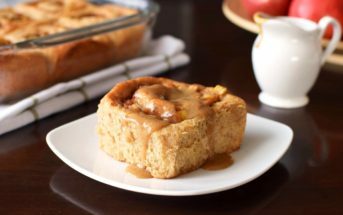 It melds perfectly with the flavors, and is overshadowed by the warm and bold extracts. But you can add shredded coconut if you want a chocolate coconut peppermint fudge bites! I bet that would also be delicious. Coconut milk beverage (the drinkable, very fluid type sold in large cartons) should not be mistaken for coconut milk in recipe like this one. Look for coconut milk or coconut cream sold in cans or small aseptic packages (about the size of a can) in the Asian food section of your grocer. I do the shake test before purchasing to ensure it is a good quality coconut milk. If you shake it and it sounds very liquidy, then there is a good chance that it won’t set up into cream when chilled. If you shake it and hear very little to no liquid sloshing around, then you’ve got a good one. Recipes like this one count on thick, creamy coconut milk. For visuals of coconut milk, coconut milk beverage, and coconut cream, see my Coconut Milk Guide. The quality of the chocolate you purchase will affect the final taste, so be sure to pick a brand that you enjoy. Some brands do add milk ingredients to their chocolate, and others make the chocolate on shared lines with milk chocolate. For dairy-free options and allergy-safe options, see my Chocolate Chips Guide. That page also includes soy-free brands and allergen information. I recommend using semi-sweet chocolate chips if you like traditionally sweet fudge bites, or dark chocolate for slightly less sweet. I also like to use Dutch-processed cocoa powder or a mild natural cocoa powder in this recipe. 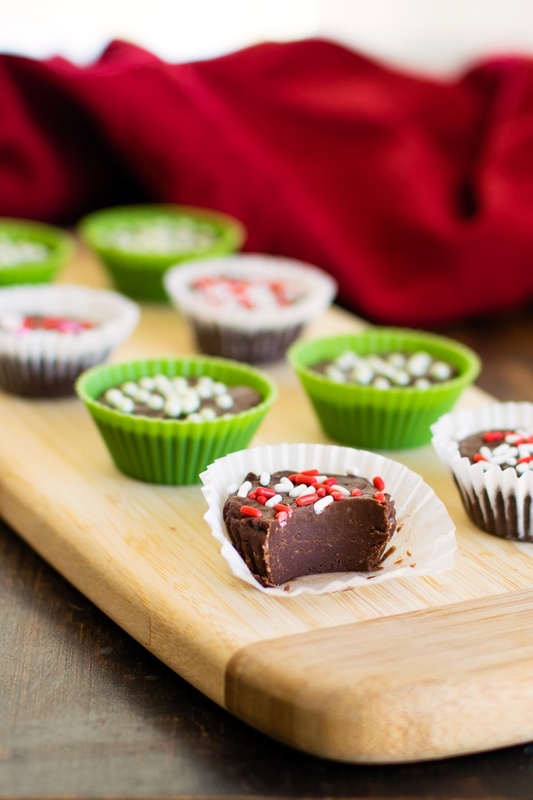 Dutch processing reduces the acidity, giving the cocoa powder a milder taste for no bake recipes like these peppermint fudge bites. By ingredient, this recipe is dairy-free / non-dairy, egg-free, gluten-free, nut-free, peanut-free, optionally soy-free, vegan, vegetarian, and optionally top food allergy-friendly. This recipe is adapted from my flagship book, Go Dairy Free: The Guide and Cookbook. 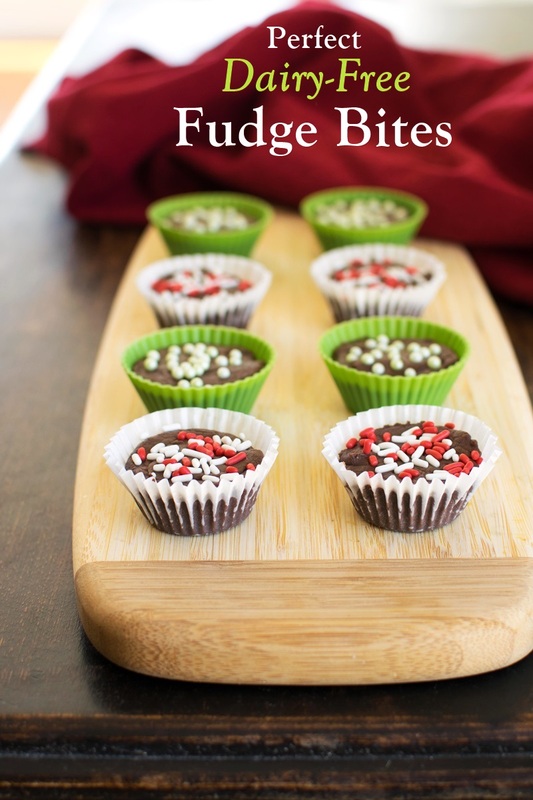 The book includes my base Fudge Bites recipe with flavor options, like this one! Please note that the Prep time is hands-on time only. Allow at least 1 hour for chilling. Separate 16 to 20 mini cupcake liners onto a tray, sheet, or cutting board that will fit in your refrigerator. Put the coconut milk and oil in a small saucepan over medium-low heat. Cook, whisking occasionally, until hot and just barely beginning to bubble. Remove the pan from the heat and stir in the vanilla and peppermint extracts. Put the chocolate in a medium bowl and pour the hot coconut milk over the top. Let sit for 1 minute, and then whisk until smooth. Sift the powdered sugar and cocoa into the chocolate mixture. Stir until thoroughly combined. The mixture will be quite thick. Fill each liner about two-thirds to three-fourths full with the fudge mixture and level the chocolate out. 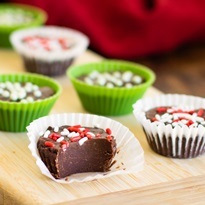 If desired, top the chocolate with crushed candy cane or sprinkles, and gently press it in. Store in an airtight container in the refrigerator for up to 1 week, or freeze to enjoy later. Traditional Fudge Squares: You can press the chocolate mixture into a small baking dish lined with parchment paper. Refrigerate for 2 hours and remove the fudge using the parchment paper before cutting it into squares. Is the coconut oil in the recipe the solid type or refractionated (liquid)? It is regular coconut oil – it should be solid when refrigerated, but melts at warmer room temperatures. These taste so good! I used 1tsp of peppermint as I really love a strong peppermint taste! Even after sitting in the fridge for a long time and the freezer they are really soft and I have to use a spoon to take them out the cups. I was out of coconut oil and used margarine, could that be tbe problem? When I put them into the cups it was thick but was definitely pourable and they are very shiny. Hi Rose, glad you enjoyed them! Yes, they will be softer if you substitute margarine. It doesn’t set up as firmly as coconut oil. Also, the richness of the coconut milk/cream you use will also affect how much it sets up. For the firmest finish, use the solid coconut cream that forms when chilled. I typically use semi-solid coconut cream – so just a very rich full-fat coconut milk. If you use one that is watery, it won’t set up firmly. These look so good and perfect for Christmas. I really like that you made them in little cupcake liners….perfect for keeping our fingers nice and clean. Just wondering how long these would last in the fridge or if they would freeze okay. I’ve made them fresh and just eaten them out of the fridge and they’re delicious so I’m wanting to make them for my daughter’s birthday but, as I’m sure you can imagine, the day before is going to be manic so I’m just wondering whether I could make them a few days out and keep them in the fridge or freezer until the party. I believe they would keep for about 1 week in the fridge, but yes, you can freeze them! You may need to let them sit at room temp for 5-10 minutes to soften before eating. Thanks for this recipe! I’ve made it a few times and it’s always delicious but I keep finding little “balls” of powdered sugar in random places in the fudge after cooling. Any ideas what I’m doing wrong? I’ve tried mixing it more and sifting it into the chocolate mixture in smaller quantities but it hadn’t seemed to help! I’ll keep making it regardless but was hoping maybe there was a trick of the trade I’m missing. Thanks! That sounds like some clumpy powdered sugar! Though I haven’t had that issue with this recipe, I recommend combining the sugar with the cocoa powder first, making sure to stir out/mash-up any clumps. You can also use a hand mixer. your recipe piqued my interest. my curiosity peaked when I peeked at it and saw it was dairy free. thanks for the yummy looking recipe. I’m going to try it first chance I get. Made these today and they are AWESOME!! Thank you for giving us some dairy free blessings! I made these last night and they are simply delicious!! I’m thinking about trying a coffee extract version 🙂 Thanks Alisa! Yum! I know my family would love it with coffee extract, too. Just made my second batch, and they are delicious! Super simple recipe that allowed my 5 year old to help! So glad you and your little one are enjoying the recipe! Yum! These look so yummy. Hoping to get into the baking mode TOMORROW! I’m running out of time. Love the looks of that new coconut product too. So easy! 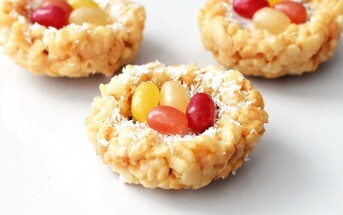 I so want to try this recipe but I only have canned coconut cream, no milk! Can this be used in place of the coconut milk? If so any idea of the quantity I would need? Yes! I’ve actually used coconut cream, too. Same amount. Give it a shake or stir (if thickened) before using. These look amazing — and simple enough that I’ll let my kids help make them. Thanks for the recipe! Wow!! Now, do you deliver…? 😉 Thanks for the brilliant recipe, Alisa! Thank you … I knew if anyone could find make and share delicious dairy free fudge recipes it would be you. Looking forward to creating some wonderful holiday delights this season.